A just released study from the Harvard T.H. Chan School of Public Health found that heat waves may actually impact the way the people think. In already stressful response situations, adding the element of elevated temperatures clearly makes things tougher on first responders. Adding cooling capabilities to an existing shelter can make a significant improvement to your operation. While our shelters are designed to stand up to the world's most austere environments on their own, adding an HVAC unit makes them more hospitable in climates where extreme (or even moderate) heat is an issue. We offer three standard HVAC units to fit easy within our shelter systems, as well as the capability to build custom systems. Paired with a quick-installing insulation package, shelters can instantly gain effective heating and cooling capabilities. The XE -1200 HVAC System offers all-in-one services for air conditioning, area cooling, dehumidifying, and portable heating needs. Completely self-contained and portable, this unit provides 3.5 tons/42,000 Btu per hour of cooling and heating. It is also available as a stacking unit, allowing multiple XE-1200 devices to be easily stacked upon transport. The Skid Mounted HVAC System offers all-in-one services for air conditioning, area cooling, dehumidifying, and portable heating needs. Completely self- contained and portable, this unit provides 3.5 tons/42,000 Btu per hour of cooling and heating. It's an excellent cost-effective HVAC unit for any operation. The Mil-Spec HVAC also is an all-in-one heating, cooling, and dehumidifying unit. 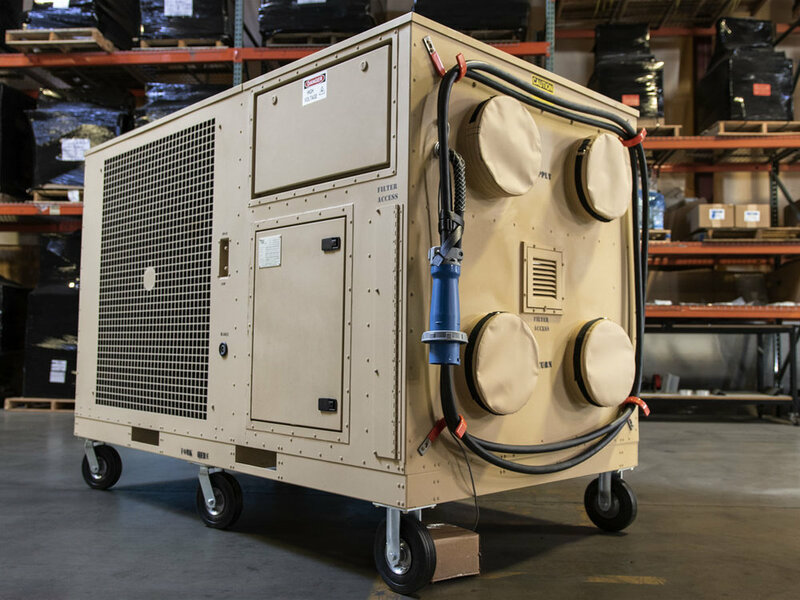 With side-by-side ducts and quick transporting capabilities, the Mil-Spec HVAC is designed to transport easily and efficiently, while standing up to the rigors of repeated deployments. Not seeing what you're looking for? We have the capabilities to create custom HVAC solutions to fit the needs of any projects. Contact us below and let us know the details of your project; we have the experience to get you what you need!